I broke my hip skiing, split up with my girlfriend, and was between contracts, but working on my own idea again. My recuperation required lots of walking, and losing weight, so the obvious thing to do was buy a netbook, install Ubuntu and go to India. I had taken for ever to get ready for my journey, being further slowed down by damaging my knee in July, and taking for ever to get my netbook ready on the (probably absurd) hope that I'd be able to some work on some of my never ending projects while on the road. I was flying Emirates, and have to say they made an immediately good impression on me. Efficient friendly, and pretty good food. Once the plane had left the gate, we just stopped and the captain announced another plane had had an accident and was blocking the runway. But shortly after we de-iced and got started. I'm a very competent sleeper, and after a bottle of wine, managed a decent night's sleep arriving in Dubai at about 07:00 local time, 04:00 CET. I wanted to visit Dubai so I could experience the world's most unenvironmental city. Apparently they even have a huge indoor ski slope! First order of business was to check out the world's tallest building the Burj Kalifa at 828m. 800m is a decent altitude difference for a walk in the mountains, and this building is seriously high, and does dominate the landscape. I had tried to book a trip up to the observation deck at a paltry 452m, a few days previously but my credit card was refused. Now it was booked out for the day. And you can't even get close to the base. Access is underground through the Dubai shopping mall, a vertiable temple to designer labels, luxury, shopping as an addiction, and no prices on display. Have to say however all shop assistants spoke excellent English, were unfailingly polite, and never pushy. Time to head off to the "authentic" Dubai, the old souk. They've actually reconstructed an old souk out at the ultra modern Dubai mall, but I want to see the real thing. To be honest its not worth it, the highlight was crossing Dubai creek in a traditional boat to get there. I've seen awesome souks in Egypt, Morocco, and Jordan; this just doesn't compare. Got to the airport nice and early. Two bottles of wine this time, and an arrival time of 02:30. I had forgotten how annoying Indian orginisation can be, and arriving in Trivandrum was a sharp reminder, while feeling frankly not my best after not having been to bed for 36 hours. The immigration queue went on for ever. But baggage reclaim! Everybody has to park their trolley as close as possible to the belt, which was from the days of 150 passengers per plane. You have to wade through five circles of tightly packed luggage carts, to get to where people are packed 4 deep. Luckily I'm tall so I could see over them to watch the band. Unluckily it took over an hour for my bag to arrive! No ATM in sight, changed the last of my Euros cash for a lousy exchange rate. It's now 04:00 and outside it's hot and busy. Taxi gridlock, and as we pull away there seem to be 100s of eating stalls in full swing. I guess international airports never sleep. Unusually I had already reserved a place in a hotel, as I didn't fancy hotel searching at 04:30 in the morning, while not yet re acclimatised to the "Indian way". My room looked out on the air conditioning of a much larger hotel next door. How will I sleep with the noise. On top of this I've been running a cold for the last few days. I did sleep, until about 11:00. 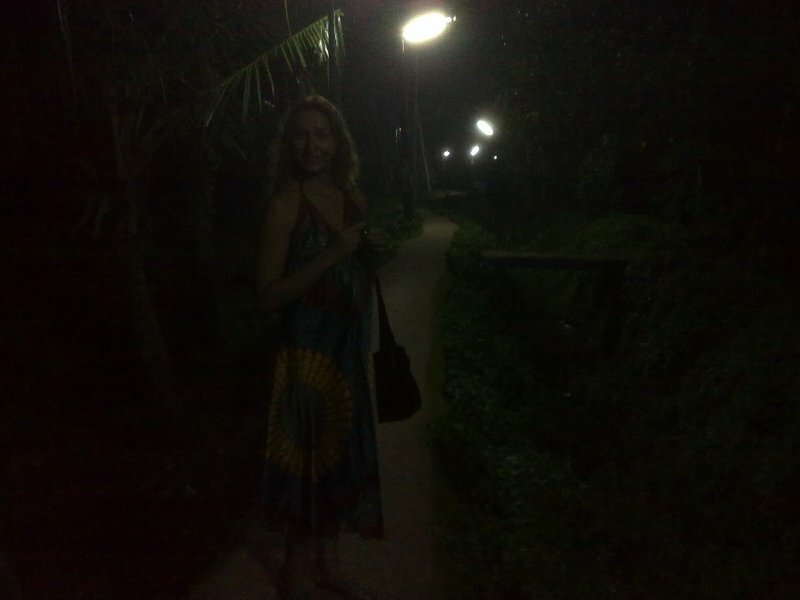 Out and have a masala dosa and determine fast that from a tourist perspective, there really is not much to Trivandrum. An ancient and impressive Krishna temple where you cannot enter, and a depressing animal park. Everybody I met at the airport and tried to share a taxi with was going to Kovalam, maybe I should too. Failed to get an Indian SIM, and didn't want to switch on my mobile with a German SIM in it. Then if people called my German number and got my voicemail, I'd pay roaming charges as calling my voicemail would be considered an Indian call! Not that I'm expecting so many phone calls anyway, but my phone is also my camera. Need to get this sorted out. Walking down the main street of Trivandrum, carrying my backpack and sweating merrily, I finally feel I'm travelling. Getting an Indian bus is always a task. Just keep asking and eventually the bus pointed to you will be the right one. On the bus meet Josef who tells me I should stay in his villa in Kovalam, and a Frenchman doing an Ayuverdic cure for his paralytic arthritis. Half the people in Kovalam are on some type of Ayuverdic gig. It's big business! Check out Josef's villa, and his rooms are nice and cheap. Decided to stay for Rp 300 per night about €5. Manage to organise a SIM at the phone shop next door. They need photocopies of my passport, and visa, a passport photo and a printed card from the hotel. Actually a few days later they tell me they need another copy of my passport. The copy of the photo wasn't good enough. Then why the passport photo? Don't try to reason with Indian administration. Also be prepared to get 4 SMSs a days inviting you to click on links that will turn your life around, and a similar number of calls from a robot inviting you to download ringtones. 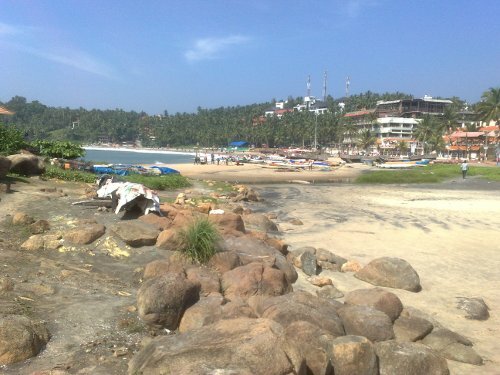 Kovalam is described as the most developed beach resort in India, and its certainly developed. Its a good place to hang around for a few days and maybe spend Christmas, which I eventually do. There's a lot of beach front restaurants full with travelers in the evenings. A lot of the restaurants don't have a liquor license. Doesn't stop them serving beer, they craftily camouflage it in a coffee mug. The local kids have hit on a money earning venture. One of them wears something red, a white beard, and a red cap. The supposed Santa shakes himself like a Capoeira dancer with epilepsy, the rest of the kids clap their hands and scream "we wish you a merry Christmas", and then try to collect money for their efforts. Not surprisingly their earnings are not impressive. My villa is a 4 minute walk through the jungle and just at the end of the jungle path is a tea house, that does thalis at lunchtime. Its the cheapest Chai house in town and popular with travelers. One of them is Sean, a hippy who gardens for 6 months back in the UK, and travels for 6 months. On 21 Dec he produces a cake and invites everyone for a solstice cake. Its a nice idea so I do the same on Christmas day, after watching hundreds of Indians going for a Christmas swim fully clothed. I of course also had a Christmas swim. My stay in Kovalam ends in a nasty altercation. I've been paying my rent daily. The first few days they noted I'd paid in the big book, but didn't thereafter. One night Josef's son tells me I owe for the the last 3 nights. I say no, I've paid daily and only have to pay that night. He says I must talk to his father. The next day Josef bangs on my door, and we have an aggressive conversation. 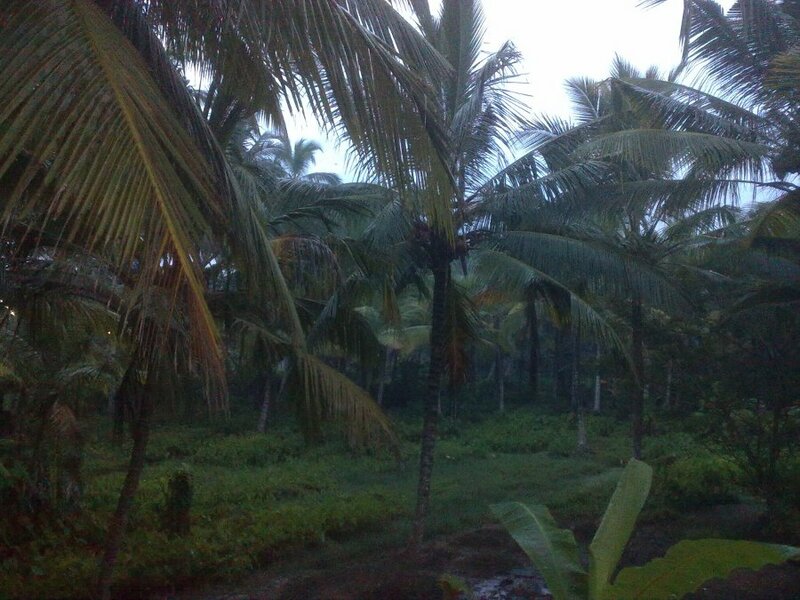 I pack up, today is a marvelous day to head to Varkala. Josef bolts the front door and demands I pay for 4 nights. I tell him I'm willing to pay the 1 night I owe. He keeps threatening to break my head, and my legs, and even his wife comes and shouts at me. I keep pointing out he's not stupid enough to hurt a tourist. He responds he'll chase me all the way to Trivandrum where everyone knows him. The impasse ends when other tourist arrives, he opens the door to let them in and asks me quietly how much I'm willing to pay. I repeat 300, and I'm out. He does however follow me all the way to the bus stop. The joke is the bus isn't going for 2 hours, and of course its going to Varkala not Trivandrum. I start writing this while drinking more chai in a small restaurant near the bus stop. It's nice to have good battery life (on your notebook). However the whole thing leaves a bad taste. While I may not be a fan of Indian orginisation and efficiency, I've always been impressed by their honesty. Already on this trip I've left my mobile phone in a restaurant, and guide book in a bank. Each time, as soon as I've appeared on the doorstep, somebody has rushed in to collect the lost item and handed it over with a big smile before I even got a chance to ask. Other than the well known gem scam, this is the first time somebody's tried to rip me off in India. Hi. I'm from Bangalore and I lived in Munich, now in Berlin. Came across your blog when I logged into TTG today. I remember Kovalam from 1993. I was around 7 and the town was completely untouched by tourism. It was a secluded beach, pale-blue water, high sands. Your photo, "Christmas day on the beach" makes me sad. I'm sorry to hear about the altercation you had with the hotel owner. As a rule, the Keralites we come into contact with in Bangalore are nurses, doctors and teachers. They're usually educated, decent, honest and a peace-loving lot except for their communist tendencies :-D. If you would imagine a Gaussian function for your probability of being ripped off or scammed in India, it peaks around the area of New Delhi, with the outlying region in the south and in the very north, i.e. around Kashmir. Have fun! Its a nice blog, and I am gonna follow it now. I am from Kerala and came here from TT. Do visit Thekkady and Athirappally waterfalls, if u r still in Kerala. If u r a foodie do try sea food and food from local toddy shops. U can take a swig too if u can stand its odour :P U can ask for Kappa and meen curry(Tapioca and fish curry). Also in kerala eating beef is a normal thing. So make sure u try Kerala beef fry. Nice blog. 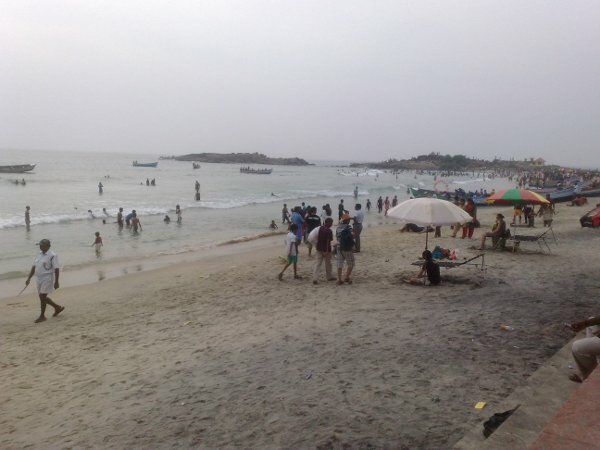 It brought back memories of Feb 2010 when I was in Kovalam, Trivandrum, Kerala, Ooti, Bangalore, Cochin, etc. Have a great trip. You can leave a comment with the form below. Your Email address is not compulsory, and if entered will not be displayed. It will be used solely if I wish to contact you regarding a comment you made. Like to inform you it's being deleted!